The more Nurgled undead started on attack and quickly badly hurt the only wight of the Stup...born ones who was able to play on the closing match of the season. After picking up the ball on their left flank the Nurgle side quickly changed sides to the right flank but the traditional Undead were too stup...born to fall for that ruse and shadowed the ball-carriers getting close to skins of the Nurgle undead. Naturally, some bashing ensued. Ball was finally grounded about four dashes away from the goal, and as there was heavy cover on the ball, so on the final minutes of the half the only chance for Nurgle to score was an elfish play of triple-dodging, picking up the ball, passing it to a player on the goalzone and finally catching the ball. Well, naturally they did just that. After some uneventful equalizer bashing the Stup...born ones took onto field to attack. And then the rain started, making this third match in a row with the Undead side playing in rain. First all looked good, Nurgle Warrior was taken out and ball was carried on the right flank with heavy guard cover. But then the Undead coach took an unnescessary risk looking for a fast score and left the ball-carrier on contact. Nurgle followed with an inspired blitz play that took out the guards of the Stup...born ones and finally knocked the ball down. 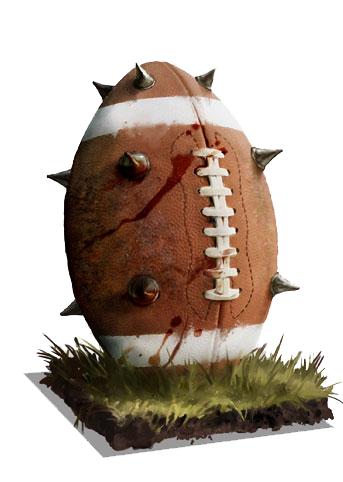 The Stup...born ones however recovered the ball and were making a change side play when the slippery wet field crashed their dreams with the ball-carrier ghoul slipping on his feet while dodging and injuring himself out. The situation would've maybe have been recovered but at that precise moment the Nurgle decided to get their punk rock attitude on and KO'd the mummy closest to ball. Then the only surviving at least somewhat agile player of the Undead was taking out on the next turn and Stup...born could do nothing but watch the Punk Rockers score the 2-0 winner. Nice and friendly match, haven't checked the stats yet but I have a feeling that dice were about even. Lars played nice and steady game and definately deserved the win. Nicely played, Lazer-man, and good luck in the next season! Thanks for the match J-Reedy was a fun one if looking on the luck statistic I was apparently a bit more unlucky than you. But my luck was really concentrated to some very decisive moments during the match. Good luck in the future. Please head over to the sign-up thread and sign up for season 34 if you haven't already!